A stunning and contemporary, five bedroom detached family home, which is well located on a sought after lane and offers the benefit of a unique water garden. 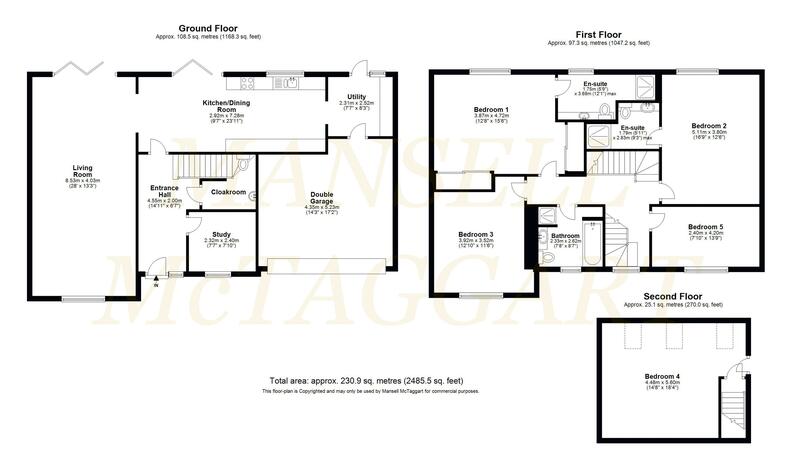 This contemporary and spacious property provides a substantial 2485sq ft of versatile accommodation arranged over three floors. The living space briefly comprises: reception hall with Oak flooring; study with Oak flooring; cloakroom; dual aspect living room with bi fold doors to the garden, Oak flooring and gel burner; stunning fitted kitchen/dining room with quartz worksurfaces, integrated appliances; wine cooler; boiling water tap; tiled flooring and bi fold doors to the garden. A useful utility room also with tiled flooring and with doors to the garden and garage completes the ground floor. On the first floor there is an impressive master bedroom with built in wardrobes and a well appointed ensuite shower room; double guest bedroom also with ensuite shower room; further double bedroom; large single bedroom and family bathroom with jacuzzi bath plus a separate shower unit. The second floor is dedicated entirely to an additional double bedroom. Externally there is brick paved driveway parking for several vehicles leading to a double garage with electric door and personal door to the house. Gated side access is provided to the rear garden which is a real feature of the property incorporating a large, timber decked area abutting the property with glass balustrading surrounding a large nature pond, an expanse of artificial lawn and decorative planting. The whole being offered seclusion from high hedge screening. The popular market town of East Grinstead is located approximately half way between London and the South Coast, boasts a wealth of architectural heritage and is surrounded by some of the finest countryside in the South East, including the Ashdown Forest. There is a vast selection of shops, pubs, restaurants and coffee shops to cater for all. East Grinstead mainline train station provides frequent services to London (Victoria/London Bridge in approx 1 hr). Ideally situated for access to the M23/M25 motorway and Gatwick Airport. From our office on London Road turn right, take the second exit at the mini roundabout before turning left at the next mini roundabout onto Ship Street. Follow Ship Street down the hill and turn left at roundabout onto Hermitage Lane, before turning right into Harwoods Lane where the property can be found on the left hand side. Do not follow satellite navigation as this will take you to the opposite end of Harwoods Lane.